Plant-based compostable plastics are going to landfill rather than recycling because almost all Welsh councils are unable to deal with them. The growth of the anti-single use plastics movement has seen a rise in the number of businesses selling food and drink in compostable containers. But of the 13 councils that responded to BBC Wales, only Caerphilly collects and composts such products. The Welsh Government has rejected calls to invest in composting infrastructure. The technology for plant-based compostables has come so far that it is hard to tell which is plastic and which is the greener alternative. 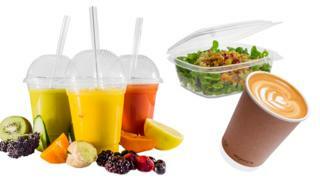 Many businesses selling food and drink are now turning to the containers in a bid to be greener. But Keep Wales Tidy said there was a risk that they could lead to "unintended consequences" because of the lack of places that can compost them. Food waste is recycled using a process called anaerobic digestion, helping to produce electricity and fertiliser as by-products. But plant-based items, including those made from polylactic acid (PLA) by companies such as Vegware, must be composted in an industrial composting process which requires heat and oxygen, otherwise they do not degrade. The BBC asked all councils in Wales whether they collect and compost plant-based materials. Of the councils that responded, only Caerphilly council collects and composts such products. Gwynedd council said it was looking at opportunities to do so. Kate Reed, owner of Tafell a Tân, a pizzeria and catering company in Llangrannog, Ceredigion, invests in a range of containers from Edinburgh-based Vegware due to demand from environmentally conscious customers. Ms Reed believed the containers could be thrown out with food waste, but she was surprised when Ceredigion council told her she should dispose of them in a black bin bag. "It is such a shame when people are making an effort," she said. "It is really worrying that we want to promote sustainability in our business but we can't do it. "At the moment we are continuing to use the products but we are going to have to look into other options. "If Ceredigion council could work with us and other businesses, then we might be able to get somewhere. But there is nothing from them, no willingness to change whatsoever." Ceredigion council has ruled out providing a separate collection service because of cost. 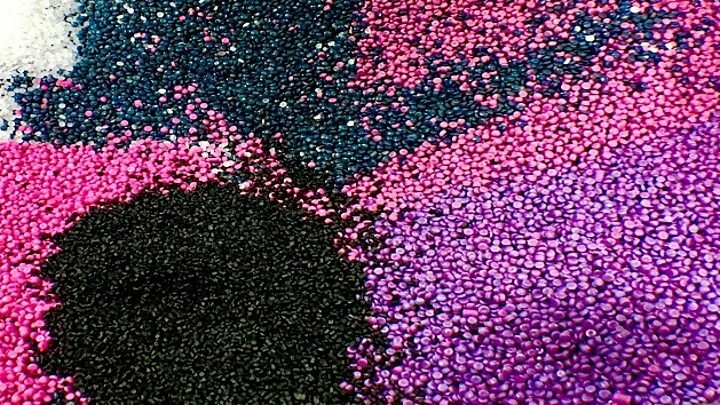 "Businesses producing large amounts of compostable plastics may be able to make commercial waste arrangements with an appropriate industrial composting facility," a spokesperson added. Vegware said it was "in discussions" with the Welsh Government about ways to have its products composted in Wales. "Wales has achieved very impressive changes to its recycling, but compostables have not been included in Welsh councils' standard provision," a company spokesperson added. "Vegware works closely with the waste sector around the UK to set up trade waste collections to suitable composting facilities, but policy has made this difficult in Wales." The Welsh Government flatly rejected the suggestion it should invest in composting infrastructure. "We have a long history of evidence-based environmental policy and we intend to continue this approach rather than putting in place piecemeal solutions to topical issues without considering whether they will work in the long term," a spokesperson said. And it seems some environmental organisations are also unconvinced about the idea of replacing plastics with plant-based alternatives. "There's a risk that the current interest in 'alternatives' may lead to unintended consequences where plastics are replaced with potentially harmful materials that aren't regulated or appropriate to our waste infrastructure," said Jemma Bere, policy and research manager at Keep Wales Tidy. "Although biodegradables have a place in our transition to a more sustainable society, and may be appropriate at events and festivals, we don't believe that they are the solution to going plastic-free. "They are, after all, single use items. We support efforts towards the circular economy and increased recycling infrastructure, where the focus is on prevention and reduction."